Join OO TOURISTIK for a perfect bike tour to get away for a short time! This bike tour is ideal for the short-term cycling holiday and you can explore the Lake District area of the beautiful Salzkammergut with your bike. Lake Attersee, the largest lake, is impressive on sunny days with its intensive turquoise water inviting you for a swim or an enjoyable boat trip. Do not miss the chance to experience an exploring journey of the picturesque Austrian Lake District that offers plenty of highlights! You will be accommodated at Hotel Ibis Salzburg Nord (three-star), Hotel Post (four-star) in Lake Attersee, and Hotel Gasthof Neumayr (three-star). You will get free Wi-Fi in each hotel and if you use E-bike, you can recharge your bike in each hotel for free. The Salzkammergut cycle path leads through the Salzkammergut region, one of the most impressive areas of Austria. There are plenty of sights which are worth stopping at during your cycling holidays. The cycle path goes past 13 lakes and the most beautiful villages of the Salzkammergut. After individual arrival for the cycling holiday, you will check into your hotel in Salzburg where you receive the travel documents for your bike tour and handover of your rented bike (if booked). Cycle leisurely from Salzburg along the cycle path to reach Mondsee's beautiful countryside. Enjoy the breathtaking mountain range of the Salzkammergut. Cycle past the well-known Drachenwand (dragon wall) south of Lake Mondsee along your cycle route, before you reach the only two-kilometer-long Seeache stream, building a connection to today's final destination. After breakfast, the cycle route returns to Lake Mondsee and leads along the north side of the beautiful Mondsee village. Cycle to lake Irrsee and reach after a leisurely cycle tour the Salzburg Lake District. Today, you are leaving the Salzburg Lakes behind. 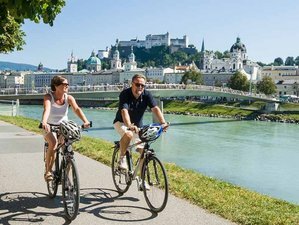 The bike tour leads in the direction of Salzburg and the river Salzach is showing you the way to the city of Mozart. Explore the beautiful sights this charming city has to offer before returning to Eugendorf. You can have individual departure or have extra nights. You can pick up your luggage at Hotel Ibis Nord (four-star) in Salzburg. Your cycling holiday in Salzkammergut region starts in Salzburg city, the City of Mozart, taking you to Weissenbach am Attersee, Obertrum, and back to Salzburg. The cycle path covers a total of 345 kilometers. 1,850 meters of altitude gain have to be covered. The cycleway is signposted in all directions - R2 (in Upper Austria), R19 with the inscription of Salzkammergut Radwe (in Styria), and green signposts with the inscription Salzkammergut Radweg (in Salzburg). Most sections of the cycle route are asphalt-covered. There is an early bird discount of 10% in case your booking reaches OO TOURISTIK at least 60 days prior to your holiday start. Children’s discount is applicable for the third and fourth persons in an extra bed with two full-paying persons.